(Coastal wormwood; San Juan mugwort) Coastal mugwort is a beautiful silvery-green variety that can be found growing on sandy bluffs and beaches along the western coastal front from Northern California stretching to southern BC. 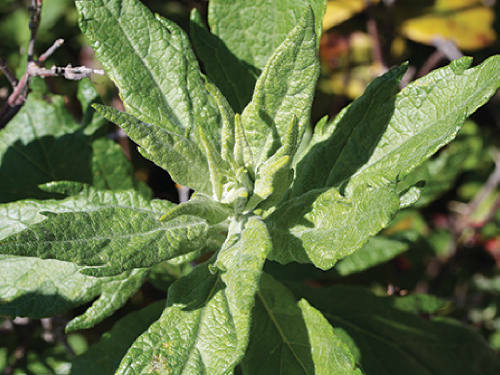 Grows with a base of bright foliage and a plume of yellow-green colored flowers that shoot upward from long stalks. Much like mugwort, the coastal variety is recognized in herbal medicine for its role in topical pain relief and wound treatments. Often made into a tonic as a digestive aid, a weak infusion also makes a good insecticide and bug repellent. Coastal mugwort is used traditionally bundled together for ceremonial purposes. Has a pleasant sage scent. Sow into organically rich, loamy or sandy soil any time of the year. Prefers full sun. Drought tolerant, deer resistant and pollinator friendly. Rhizome based spread. Height 18-36in (45-90cm).